It is tempting to convince yourself and your playing partners that there is enough time to finish your round, or at least a few more holes. If The Golf Course Superintendents Association of Americayou play on, instead of seeking shelter, your great round could become the last round of your life. 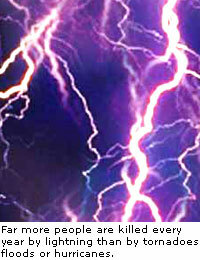 Every year more people are killed or injured by lightning than by tornadoes, floods or hurricanes. 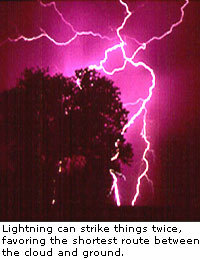 In fact, it's estimated that in the United States, as many as 300 people are killed by lightning each year. Because of the generally open areas with scattered individual trees, golf courses are dangerous places during a thunderstorm. A lightning bolt will take the shortest route between the cloud and the ground, which means that a golfer standing in the middle of a fairway or huddled under a tree is a prime target for a strike. 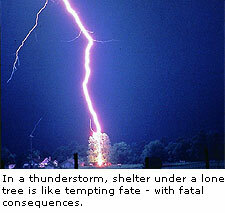 Seek shelter at the first sign of a thunderstorm. If the course's warning system sounds, take cover. If possible, get off the golf course or go to a designated lightning shelter. If your shoes have metal spikes, take them off. If a player in your group is struck by lightning, the person is no longer carrying any electrical current, so you can apply first aid immediately. The golfer will be burned and have received a severe electrical shock. People who have been apparently "killed" by lightning can be revived if quick action is taken. If you must make a choice, treat those who are not breathing first -- those who are unconscious but still breathing will probably come out of it on their own.First aid should be rendered to those not breathing within four to six minutes to prevent irrevocable brain damage. Mouth-to mouth resuscitation should be administered once every five seconds to adults and once every three seconds to infants and small children. However, if the victim is not breathing and has no pulse, cardiopulmonary resuscitation is necessary, but should be administered only by persons with proper training. You should also check for burns along the extremities and around areas in contact with metal, give first aid for shock and then send for help.